I manufacture, and sell fully equipped boiled peanut trailers. Our boiled peanut trailers have everything you need to start a very profitable business, full time or part time. Two 27.5 gallon stainless steel pots with custom made heavy duty lids. Each pot cooks and serves 25 lb of peanuts. Two 130,000 BTU wind shielded high pressure propane burners, featuring hard piped copper gas lines with separate brass valves. This allows each burner, and each propane tank to operate independently. Two adjustable propane regulators, two full 20 lb propane tanks. Trailer lift, stainless steel quart scoop. The trailer is a 4' x 6' (10' including tongue), which is sized to fit into 10' event spaces, and still have room to work. It is D.O.T. approved with a 2000 pound capacity, and is titled. This basic model trailer is equipped with everything you need to start a very profitable business. The setup can also be used for pork skins, hot dogs, corn or anything else that boils or deep fries. Only the best parts were used to fabricate this trailer. I can add anything you want, but the basic trailer is complete with everything you need to cook, and serve boiled peanuts. Complete cooking instructions, recipe, supplies, and replacement parts information will be provided with each purchase. I'm always available after the sale for any further questions you may have. Boiled peanuts are a year round concession. See our basic trailer, and contact information in the photos above. Custom trailers built to your specifications are also for sale. How much would a business like this cost to get started? I am with a church that does a lot of selling and we are looking for a peanut boiler that will handle 100 and what is the cost? We received exactly what was promised to us at purchase. However, after maintaining the equipment as instructed, one of the pots had rusted through completely in two weeks. I provided picture evidence to the maker and he told me he would get back to me. This customer contacted me about the pot problem, and I immediately began the process of solving the problem. The pot had a thirty day defect warranty from the manufacturer. I contacted the manufacturer, and informed them of the situation. The manufacturer assured me he would replace the pot. He needed pictures, inside and outside, of the pot. I forwarded them to the manufacturer, and the pot was replaced. The customer has since contacted me, and assured me he would provide a favorable reference to anyone interested. I stand by my product, if given the chance. I've been building the trailers for ten years with minimal problems, which were all solved because of mutual cooperation between customers, and myself. I can provide multiple references including one from this customer. As noted above, the pot was replaced once the pictures were obtained. Croft did, in fact, stand by his word and replaced the faulty equipment. I would like to add that I have found that boiling peanuts can be an incredibly profitable business, and Croft has plenty of knowledge and expertise to share. If you are interested in pursuing this venture, please disregard my previous comment, as the problem was resolved after it was posted. I was mislead by the manufacturer of the pots that I recently used on my trailers. This is the second customer that complained about these pots. The manufacturer told me that occasionally there is this problem with the pots rusting. Those pots are advertised by the manufacturer as 100% stainless steel. I have used a lot of these pots on several trailers without any complaints, or problems. For the last customer that had this problem I was able to get the pot replaced, and he has had no further issues. As a result of the problem with the pots, I have returned to using 55 gallon stainless steel drums on my trailers. I have used these stainless steel drums for ten years without ever having an issue. The reason I switched was because of the availability of the drums. I have now reestablished a source for the drums and they will be used on all my future trailers. I do my very best to satisfy all my customers. I would be a fool not to. I can assure anyone that my trailers are a very good product, and by returning to the stainless steel drums that that there will be no problems in the future. If you have any concerns, I have dozens of references that verify the quality of my trailers. I, unknowingly, made a mistake by using the the pots that had the problems. I used them on about 15 trailers, and had two complaints. If you'd like to see how I was misled, you can get on eBay, search for "120 qt stainless steel cook pots" and see for yourself how the pots are advertised. The listings states that they are 100% stainless steel. I had no idea that they sometimes had problems. Returning to the stainless steel drums eliminates the only problem that I've ever encountered in the ten years while I have manufactured these trailers. When I purchased my trailer I had absolutely no experience in making or selling boiled peanuts. I bought the setup from Bill with the 2 pots and burners plus the umbrella sometime in 2011. I used it for about a year before circumstance persuaded me to sell it. Mr. Croft was very pleasant to deal with and very knowledgeable about the industry. The trailer was very well built, constructed of high quality material. The way in which the gas lines and valves are setup make it easy to use and deal with. With the purchase I received an information packet with sales strategies and recipe information that, along with Bills patient answers to all my questions, were indispensable. I was not just satisfied with the purchase, but very happy. I had a lot of fun selling and of course eating tons of boiled peanuts. 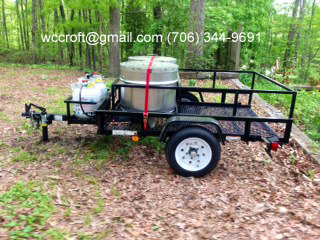 I would highly recommend Bill Crofts peanut trailer. I appreciate the positive review of my product and services. You are a valued customer. If there's any way I can assist you, in the future, contact me. Thank you so much for all your great helpful information! My nephew is 45 yrs old raising 10 yr old twins, boy & a girl. He has just boiled a 30 qt pot of boiled peanuts & they are great. Twins' mother died when they were 9 months old & he is a stay at home dad & has done a great job. He REALLY needs to make some money, but he (we) put them in qt size bags & only got 5 bags, not weighed & says he's going to sell them for $5 a bag. Could you please write me back and let me know what a fair price really is? They were cooked last night so not put in plastic bags while hot. I think you mentioned containers that he could use & sell them while hot, right from the pot like you use. He needs to know what size(s) and fair price. Now I'm going back to read everything that you wrote. My email address is: kayinabinet@gmail.com. Thank you so much for your help. We are in Lugoff, S.C. next to Camden. I'm not sure I understand your question, but I'll try my best to answer it. In a 30 gallon pot, you should be cooking 25 pounds of peanuts. That should yield approximately 55 quart bags. I'm not sure how many you cooked to only get 5? It cost the same, in propane, to cook 55 as it does 5. If you're pre bagging and trying to sell them cold, that's not going to work out for you. I sell mine hot right out of the pot. I bag them in food grade plastic bags. They don't melt. Some people use cups, but they are bulky and expensive. As for pricing, here's the breakdown. Peanuts cost approx $1 a quart to produce. That includes the peanuts, salt, bags and propane. If you cook 25 pounds and get 55 quart bags it cost you $55. If you sell them for $5 a quart, your profit is $220 for each 25 pounds cooked. That's a very good profit margin. I sell mine for $4 a quart, which is still a good profit. If you want to make very good money, you have to have a trailer. The trailer I sell has two 27.5 gallon pots. Each pot cooks 25 pounds of peanuts. The trailer makes everything a lot easier. Frankly, peanuts are almost impossible to do without a trailer. It's too much work! The trailers I sell are completely equipped with everything you need to cook and serve peanuts. Included in the purchase is a complete information package. I'm always available after the purchase for any further questions you may have. If you don't have a trailer, peanuts are nothing more than a hobby. With a trailer, they are a very profitable, year round, life long cash business. I hope this info helps answer your questions. In my previous answer to the question from Kay. I misunderstood the fact that you used a 30 Quart pot to cook the peanuts. I thought you meant a 30 Gallon pot. A 30 Quart pot is too small except for personal use. Can you make a trailer that could be fitted to a three wheel bicycle? But light to have all the trimmings including a small sink and work table that is connected and maybe folds down. If this is a task you feel that your up to contact me at k3v_77@yahoo.com. Thanks, looking to hear from you soon. Price of trailer. I'm interested in bringing boiled peanuts from the South to Midwest Ohio. Loved them while living in Florida. Although, I do custom trailers, the customer usually adds whatever they want to the basic model. As far as a trailer to be customized to a three wheel bicycle, I don't think it would work. The standard trailer can be pulled easily with a compact car. With the equipment, you mentioned adding, I don't think it could be pulled by a bicycle. It would just be too physically challenging. If you wanted to try it, simply mount a 1 7/8" ball on the back of the bike. I wouldn't recommend it. Sinks are rarely required. If it isn't, I wouldn't install one. I advise customers to start with basic trailer and add items as needed. Having said all that, if you had a sketch or plan, I would try my best to meet your needs. If you do have an idea of how you want it done, contact me at wccroft@gmail.com. The two pot trailer retails for $2500 total. The four pot is $3500 and the six pot is $4500. All models are complete with everything you need to cook and serve peanuts. The standard trailer includes; 2 - 27 1/2 gal stainless steel pots with heavy duty custom made lids. (each pot cooks and serves 25# of peanuts). 2 - 130,000 BTU wind shielded high pressure burners (hard piped w/ copper gas line w/ separate brass valves, which allows each burner and each propane tank to operate independently). 2 - adjustable regulators. 2 full 20# propane tanks. A swivel trailer lift. A stainless steel 1 qt scoop. Parts used for cooking (pots, lids, scoop) are stainless steel. The trailer is a 4x6' (10' including the tongue) which is sized to fit into 10' event spaces and still have room to work. It is D.O.T. approved, has a 2000# capacity and is titled. This basic model trailer is fully equipped with everything needed to cook and serve peanuts and start a very profitable business, full time or part time. Peanuts cost $.75 a qt to produce and sell for $4.00 or more. Unsold peanuts can be frozen and reheated for later use or precooked and frozen for large events. The setup can also be used for pork skins, hot dogs, corn, stews or anything else that boils or deep fries. Only the best parts are used to fabricate this trailer. Custom trailers are available. No experience is needed. Complete cooking instructions, recipe, supplies and replacement parts are provided with purchase. I'm always available, after the sale, for any further questions you may have. The season is always just getting started. Peanuts are a year round concession. The sell as well in the Summer as in the Winter and the profit margin is amazing. A great fundraiser for any type of organization (churches, scouting, band boosters, sports teams, charities, etc.). A great money maker at school and county sporting events, festivals, car shows, races, rodeos, etc., or roadside stands. Fresh vegetables are a great addition in their season. Hello, just wondering where you are located and how can I get in touch with you. I would love to introduce boiled peanuts here; absolutely no one makes them around me. I think boiled peanuts are a great football watching snack, which is big around here. I thought I could try them out at local farmer's markets and see if enough people like them to justify buying one of your trailers. Is this trailer easy to re-sell if things don't work out and these Northerners really hate boiled nuts? Usually, in locations that don't typically have boiled peanuts, my customers do very well. No competition is a great thing! You could try selling them in various places, but there's no substitute for a trailer. When the pots are boiling and the smell of fresh peanuts are in the air it draws in the customers. The trick is to get them to try them. Usually, once they do, they're hooked. A trailer, lots of signs and a good spot are the secrets to success. I don't have any problem selling trailers nationwide. I don't imagine reselling them would be much of a problem. Now is the time to find out. The Fall is just around the corner! It's the busiest and best time to get started. It's really not much to invest in a chance to make a lot of money. If it doesn't work out, you can resell and get most of your money back. Give it a shot. I'll provide all the info and support to get you going. I was wondering how much for just 2 pots. I've got a trailer & thought about making my own pots out of a stainless steel 55 gallon drum but my mig welder isn't set up to weld aluminum. I don't need the gas lines or burners, just 2 pots & the lids. Thanks. What speed can you pull that 4x6 trailer at before it wants to sway bad behind tow vehicle? I've towed the trailer at 65+ mph with no problems. I live in Georgia and have had customers tow the trailer, as far away as Texas, with no problems. The added weight, of equipment and peanuts, stabilizes the trailer. It is a DOT approved trailer. Hey Bill, I just wanted to take this opportunity to say "Thank You". As you know, I purchased the peanut trailer 3 weeks ago and it has already generated me a total of $2330.00 in additional income which all goes toward my ministry ThumbsUp Ministries. This is only approximately with only about 18 hrs. of work not including cooking the "Goobers". You have been there to coach me in my new venture with full support since I am new to this industry. I would refer anyone who ask to you because you are exactly who you say you are. I bought this setup just a few weeks ago and it has been great. I set up on Thursday, Friday and Saturday and the first day out I made $ 184.00 and have made over $600.00 in a three day weekend. This is the greatest deal I have tried. Thank you Mr. Croft. Very interested in your trailer peanut hookup. I am in Baltimore. What are your delivery options? Sorry, but I don't ship the trailers. I have had customers make the arrangements to ship them on their own. The trailer would have to be paid in full before the shipping. If you have any further questions, you can contact me at wccroft@gmail.com. Would u sell me everything but the trailer? And what would it cost me? If I was to buy one where are you at to pick it up? I live in Dawsonville, Ga. It's about 40 miles north of Atlanta. Most customers pick up on weekends, but any day can be scheduled. I can sell the equipment for you to install on your trailer or I can install it. I don't know which way you want to do it. Contact me at my email, wccroft@gmail.com, and we'll discuss it. Just a reminder, not that you need one, that Spring is right around the corner! It's the unofficial start to the boiled peanut and produce season. It's going to get very busy with Spring, Summer and Fall activities. Roadside stands have to be established early in the year before the potential areas are claimed by others. Building the trailers, I really feel the pinch! Once the weather improves, I usually begin to get backed up on orders. I don't cut corners to produce a faster product. I manufacture the same quality trailer, no matter what time of year. Because of volume, the timeline on providing the trailers increases. At present, it takes about 10 days from the time I receive the order. As orders accumulate, that time will increase. I encourage anyone wanting to get a nice early start, to order as soon as possible. Everything needed to cook and serve peanuts is included with the complete trailer. No experience is needed. I provide a complete info package and after sale support as long as you need it. So, get you a trailer now and get out there and start making some excellent cash! Full or part time, life long, no boss, cash, fun business with one investment that's earned back quickly! Sounds good, doesn't it? Believe me, it's great! Have you had any customers from Utah or surrounding states inquired about starting a boiled peanut business? I've loved them since a young age but never ran into anyone who had heard of them. I have a vacant snow cone shack and was thinking of using that. Just curious. I've sold trailers in Texas, California and New Mexico, but not in Utah. The customers, in those states, have done very well because of no competition. They had problems, at first, with people not knowing what boiled peanuts taste like. Once they got established, their sales began to increase. They use lots of signage and provide samples. It doesn't take long to build a customer base. The snow cone building sounds good. I would decorate it, loudly, to attract as much attention as possible. You should be able to make some good money. Sorry Lorrie, I don't finance. Your initial investment can be recovered rather quickly, especially if you do big fairs and festivals. I profit more than what the trailer cost in one big weekend festival. I do the Moonshine Festival in Dawsonville, Ga. There's 120,000 people there for the three day event. I always clear more than the cost of the trailer that weekend. What is the cost of this setup? There are three models available. All are completely equipped with everything needed to cook and serve boiled peanuts. The two pot is $2500, the four pot is $3500 and the six pot is $4500. However, due to material cost increases, there will be a 10% increase, across the board, as of May 1st. This will be the first increase in over four years. Any orders, with deposits, received before May 1st will be charged the rates listed above. The price for the standard two pot trailer has increased 10% to $2750 as of 5/1/17. It's the first increase in four years and is due to material price increases. It's still a great deal for turnkey business. This is some thing Iv thought about doing. IN FL no food lic is need by the state. BUT local city its likes the KGB is asking. Im like MS, I just wanna sell boiled Pnuts on the side of the road. Business Lic $250 bucks for 6 mos, Full background check that I have to pay for. Local cops have to fingerprint me. Again I have to pay for. Anyone else what are you going thru to sell Boiled P-nuts ????? i forgot to ask you bill do you take credit cards? Contact me and I'll provide all the info you need. I know some states and counties are ridiculous about their requirements. I live in North Georgia. All that's needed here is an annual vendors permit. It costs $100 a year. If you can wade through the regulations, the profits will make it well worth your while. It sounds like those regulations probably pertain to all types of business in your area. Sorry, I don't accept credit cards. How do you drain the pots after cooking do they come with a drain at the bottom? I've installed drains in the past. The problem is that they eventually leak. It caused by the constant heating and cooling of the pots and drains tend to get bumped a lot during handling. The quickest and easiest way to drain the pots is to just lift them out and dump them. There's never more than 10 gallons in a pot. Occasionally, if they're completely full, I use a gallon pitcher to empty them enough to lift out. It's a lot better than having a leaking issue. You're absolutely right. That fee is completely unreasonable and, without a doubt, the worst I've heard of nationwide. Still, if you break it down, that fee totals about two dollars a day. It can easily be made on one weekend. It would be a shame you to miss this opportunity because of some ridiculous six month fee. Are there no peanut vendors in your are area? I would try to discuss it with them. If there are vendors, it must be doable. The written permission from the property owner is a very common practice everywhere. I hope you can work it out and get started making some very good money. Does anyone have Bill Crofts Cell # to purchase a trailer and pots? Look at the photographs. His email address, and phone number are in them. We didn't post them in text for his protection from automated skimming by web robots. It takes about ten hours to boil a pot of peanuts. On my six pot trailer model, all the burners can be operated separately or all at once. So, it would take about ten hours to cook all six pots. I want to learn how to boil 20 lb of peanuts. How long to let soak then how long to boil,when to add salt, how much salt to add and any other helpful tips. Thanks. This recipe is for raw, dried peanuts. They are available in 25# bags. Green peanuts cook in less time, but cost more by weight. Also, green peanuts will mold unless stored in refrigeration. Dried peanuts are much easier to store. First, I don't soak my peanuts. Unless you soak them for a very long time, most just float on top anyway. So, skip that step. I don't know what size pot your using, but I recommend a 100 qt pot. You can use a smaller pot, but you'll have to really watch your water level. On my trailers, I use half of a 55 gal stainless steel drum with custom made lids to cook 25#. If you buy commercial pots, be sure of the quality. Most quality commercial pots are very expensive. Place the nuts in the pot and then fill the pot, with water, up to about 4" from the top so they don't boil over. Add the salt now. Grocery store brands are the cheapest. Salt is salt. You can use iodized or fee running, makes no difference. I add 1 round box for every 10 pounds of peanuts. You may have to adjust the salt to your taste. Turn the peanuts on high and bring to a rolling boil. Maintain a rolling boil throughout the cook. Stir well every couple of hours. Cook for 10 to 12 hours, depending on how you like them. They're done. They can be frozen for later use. If you're considering a commercial venture, a trailer is required. You'll understand why when you try it or you can read answers on this page discussing it. Is the six pot trailer the same size as the two pot trailer? Could make a difference if my state requires something else be installed on the trailer. The six pot trailer is a foot longer than the others to accommodate the extra row of pots. I'm not sure what state you're in or what additional requirements would be needed. I've sold six pot trailers in several states with no issues. ghost peppers and Ghost pepper jelly (I grow my own Ghost peppers). I am located in central Florida on a busy road. We have annual bike fest and also are on the outskirts of the "The Villages" season is about the start. Any helpful input would be of great help. Once again thanks for your time. My advise would be to be consistent with your product and with your daily hours. Reliability is really important to maintain a good customer base. Of course, if you want minimize your work load and be successful, you’ll need a trailer. Everything can be prepared and maintained at home. If I order the four pot trailer does it still just come with two tanks? What is the possibility of some kind of a roof/hood/cover, awning (metal)? What do you recommend? What keeps it from being back heavy if I step up on the back of the trailer...don't want to burn myself or anyone else with hot brine. How can I get a good peanut supplier? 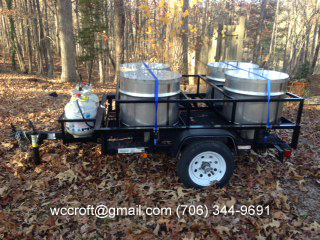 The four pot trailer only comes with two tanks, which operate all four burners. Some customers prefer larger, 30 gal. tanks, which are an option. Usually, two tanks are sufficient for a weekend event. I don’t provide any type of cover. The best cover is a 12’ market umbrella. It covers the entire trailer and some area around it. It will extend approximately 3’ on each side of the trailer to cover the serving area. As long as the front pots are full, the trailer will not tilt. If not, a block of wood under the rear frame will prevent any tipping. I don’t ever get in the trailer. The trailer is usually operated from the ground. I don’t know what’s available in your area. Usually a State Farmers Market, a large produce supply or even a grocery store are good sources for peanuts. If a grocery store produce department doesn’t carry them, they can order them for you. Ask a local peanut vendor where they get theirs.